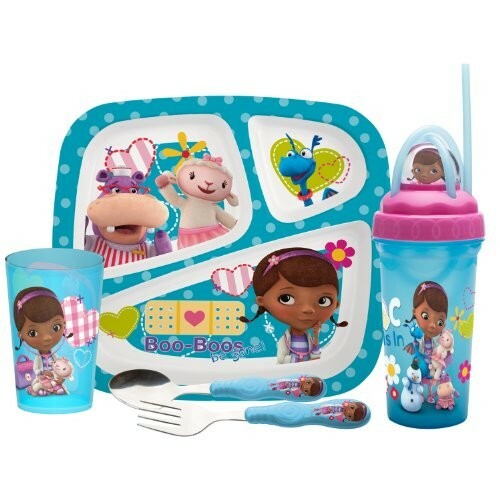 Make mealtime fun and easy with the Doc McStuffins mealtime set by Zak! Designs. This five-piece set includes a dinner tray, stainless steel flatware, a Buddy Sip straw cup and a 14-ounce tumbler -- all featuring Doc McStuffins graphics. Easy to care for and fun to use, the set is entirely dishwasher safe and is constructed to last of 100% BPA-free materials. For more products featuring this popular TV character, visit our Doc McStuffins Collection.